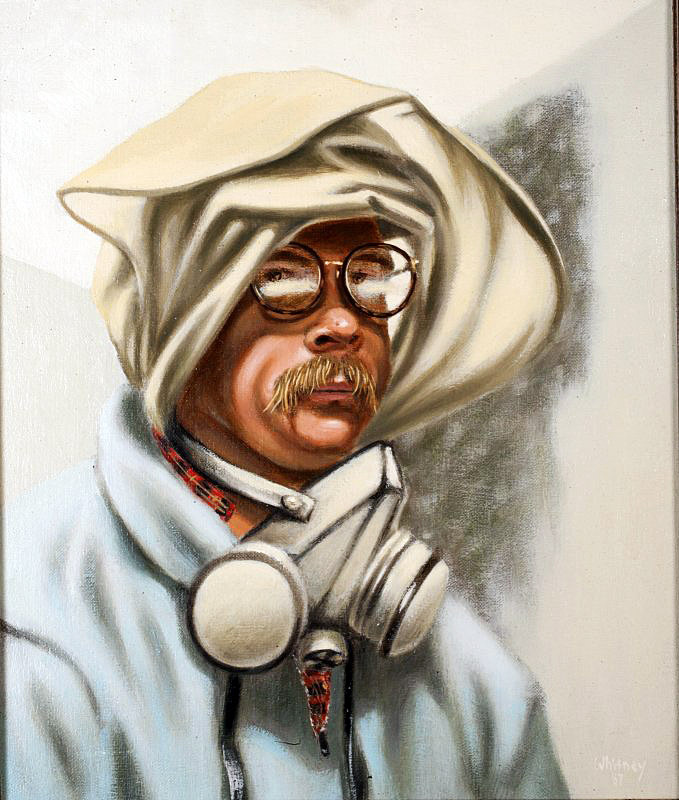 Magical realism is the watchword of the Whitney Snow solo retrospective on display at the Scarab Club – the first since the painter’s passing in 2006. Snow certainly captured the spirit of magic realism, wherein surreal or “magical” elements are introduced to otherwise everyday scenarios. 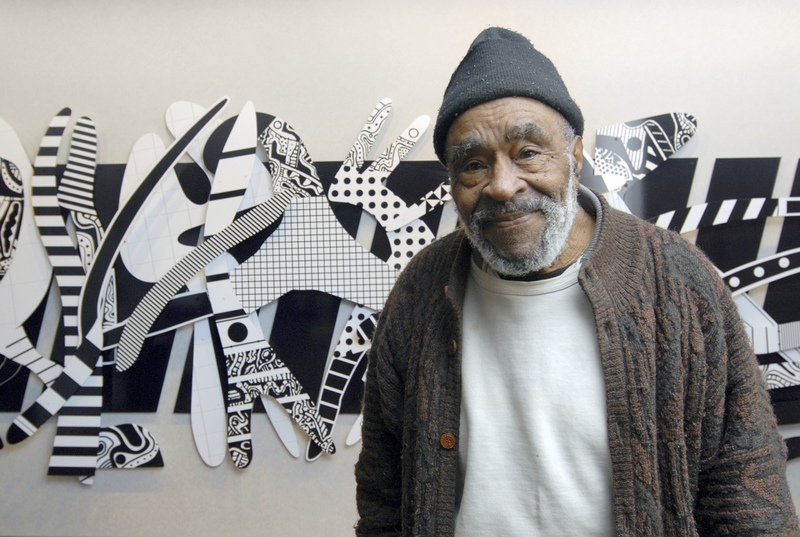 Likewise, his large-format paintings contain many cultural and art-historical allusions, as well as a symbol set designed for sly, if somewhat abstracted, political commentary – another imperative of magic realism as a device is its use in holding a somewhat whimsical or disruptive mirror to society or culture. In these respects – and in terms of realizing technically well-rendered tableaus – Snow’s work is very successful. But there is a creeping sense of vagueness that makes it hard to digest these images, on some level. Snow’s scenarios are, at times, amusing, but their magical elements leave them steeped in a kind of cartoonishness that makes it a challenge to take them very seriously. There is a fable-like quality to their narratives – again, much in alignment with the history of magic realism – but these protagonists engaged in foolish or nonsensical pursuits seem largely unmoved by their surrounding circumstances. One might expect a glimmer of consternation from the subject of Technology on my Back, who is being ridden like a backpack by a green demon of gambling and internet addiction, but there is barely a frown. 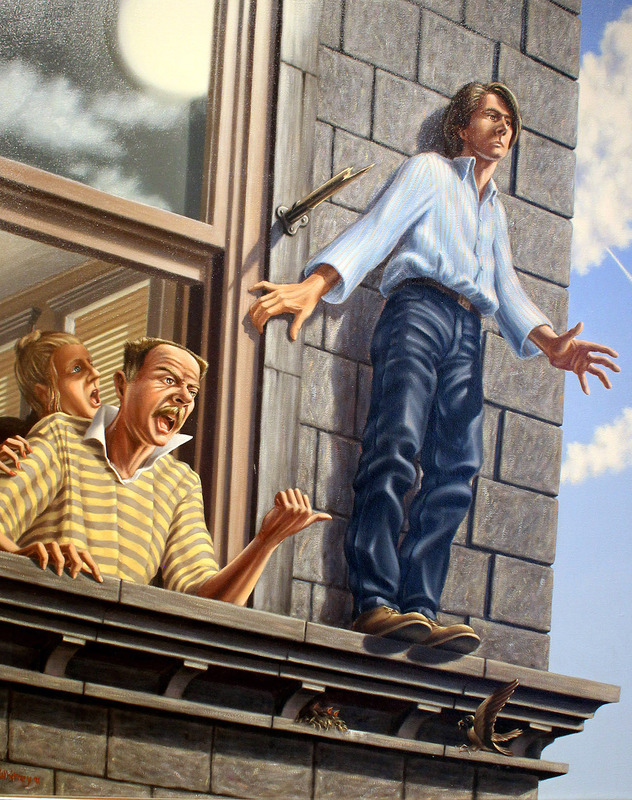 One might anticipate high drama from the subjects of Living on the Ledge, a couple standing at the window addressing a third person poised to jump off a high ledge – the man on the ledge seems utterly indifferent, and the one at the window seems, at most, peeved. The de facto expression for Snow’s subjects is a deadpan. The experience of viewing his paintings is much like hearing about a crazy dream someone had last night – doubtlessly, each element is all terribly meaningful…but it lacks a kind of visceral immediacy to engage the viewer. This is particularly surprising, in light of Snow’s rather virtuosic ability to visualize his dreams. Arguably, this does not represent a problem. Indeed, all of these things – dream states, nonsense, and reality-disconnect – fit within the stylistic mechanisms of magic realism, and that being the stated parameters for Snow’s oeuvre, it is rigorously on-target. So, too, there is a wealth of symbolism, both in the form of pop cultural references and the complete canon of art history, from Roy Lichtenstein to the Greek muses. One imagines that a well-versed art historian could be happily occupied for some time identifying and picking apart these Easter eggs. This viewer, however, remains unmoved. 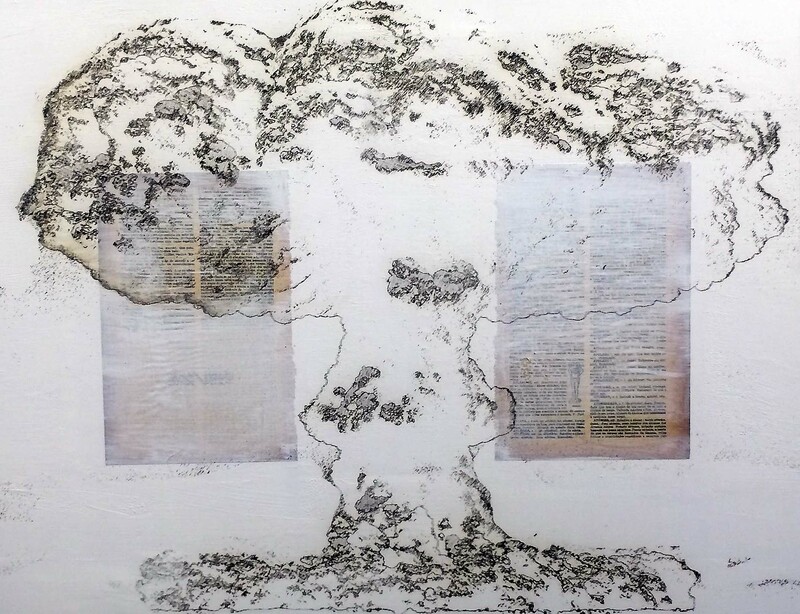 Snow’s work seems to be a failing of both the magic and the real – too fine in its details to embrace abstraction, too wedded to some kind of discernible references to transcend the source material. The Easter eggs are just sitting there, right in the middle of the lawn; picking them up offers little satisfaction. 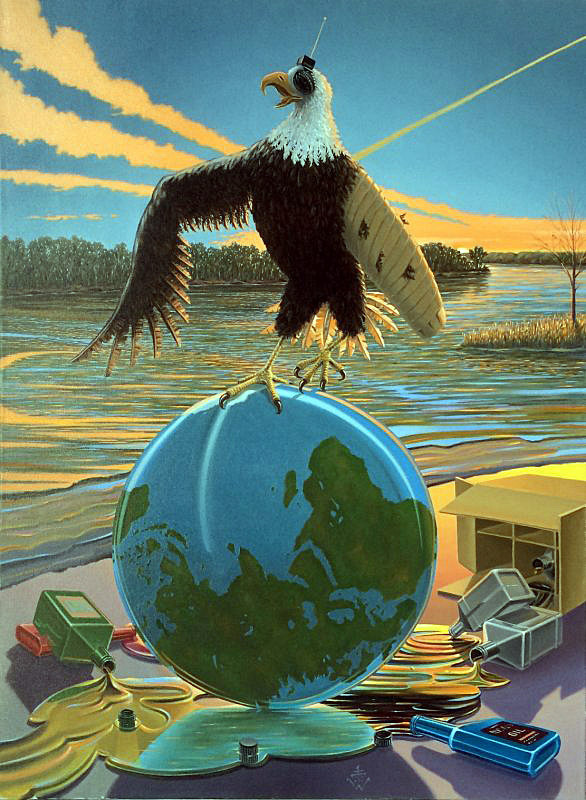 And though it is wrong to fault an artist for making work that lacks relevance a decade after his passing, the current-day political stakes honestly feel just a little too high to swallow social commentary as generalized as American Sunset, wherein a bald eagle with a broken wing (get it?) sits atop an upside-down globe (get it???) soaked in a pool of spilled motor oil (GET IT???). One detects a hint, at least, that this master painter perhaps defaulted overmuch in the direction of his impish spirit; press beyond the magical veil, and you find a more serious sentiment. It is that gravity, more than Snow’s fanciful and magical tableaus, which inspires great curiosity in this visitor to his mind palace. “Writings on the Wall,” Vagner Whitehead’s farewell solo exhibition currently on view at Cass Café (he’s sadly leaving us to take a job in Texas, he’ll be missed on the gallery circuit and at Infinite Mile Detroit, where Whitehead and I were colleagues) provides an interesting counterpoint to the ideas I’ve been juggling lately about identity-based work. Generally speaking, I find it problematic. My definition of the genre ropes in any work that takes as its subject an examination, unpacking, or sounding board of the earthly presence of the maker herself- her body, her biography, her socio-economic place, her sexual orientation, any and all factors that combine to make her who she is. Such work carries the risk of lapsing into self-examination that effectively shuts the door to any possibility for true communication or transcendence. The presence of casual self-portraits and other Snapchat-worthy visual flashes in Whitehead’s work quickly establishes as its subject an exploration of the artist’s identity. Whitehead avoids the drab self-examination so common to this type of work, however, through an intriguing mixture of cross-pollinating media, differing modes of visual communication, and a beautiful, over-arching theme of movement- manifested specifically in flight- that opens up what so often presents as a sealed conversation between the artist and her ego. “Writings on the Wall” somehow places its maker both center and off-center through a multi-paneled, open-ended meditation on the rhymes that ring between migration, barriers in communication, and the bridging of these distances by any means necessary- via text (presented in collaged leaves from found books) transcriptions of sign language delivered in drawings of hand movements, gorgeous, juxtaposed studies of airplanes and birds, scaled-up prints of typeface lettering, and, amid the cacophony of rote communication, brief moments of non-verbal respite that read as breaks in a migratory journey- delicate graphite studies of intimate moments of iPhone-captured eye contact with the artist himself, or with lovers on languid, bed-bound mornings. Mylar overlays wreath milky glazes over rapid-fire selfies, combining with their carefully considered graphite rendering to elevate them into sacred territory. One gets the impression that the wonder with which Whitehead approaches these mundane likenesses is, somehow, not self-regarding, but universal- that it carries a subtle lesson in the true purpose such images carry in popular culture. Whitehead balances his busy, content-loaded transcriptions of movement with these contemplative, humble moments of stillness (so difficult to grasp these days) that carefully articulate, in dissonantly traditional media, the nearest we can possibly come to identity in a world with a constantly shifting, evolving ground that threatens to swallow us up if we don’t document every moment of quiet autonomy we can. Whitehead’s work in “Writings on the Wall” captures, via quaintly allegorical images and materials, the overwhelming speed with which we must move through an increasingly global, competitive art world, spanning distances similar to those a migratory bird must cover in order to survive. The same distances which technology- airplanes, printed text, smart phones- can cover instantly and effortlessly. The part of us that is still struggling to cross oceans, using only our bodies and what we can articulate with our hands and our brief, snatched experiences of true connection, is one key to the ideal execution of identity-based work. 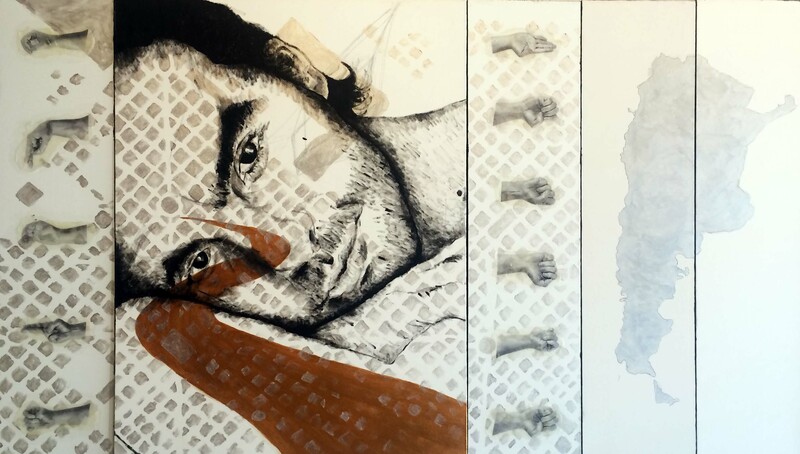 This work can tell us something about how, and why, we build visual narratives around ourselves as we navigate contemporary life. Spanish-born sculptor Jaume Plensa is perhaps best known in the United States for his permanent Crown Fountain installation in Millennium Park in Chicago. This sculpture, which projects recorded footage of the faces of dozens of Chicago citizens into 50-foot towers that flank the fountain, distills Plensa’s abiding interest – the maximizing of human forms to the scale of landscapes. 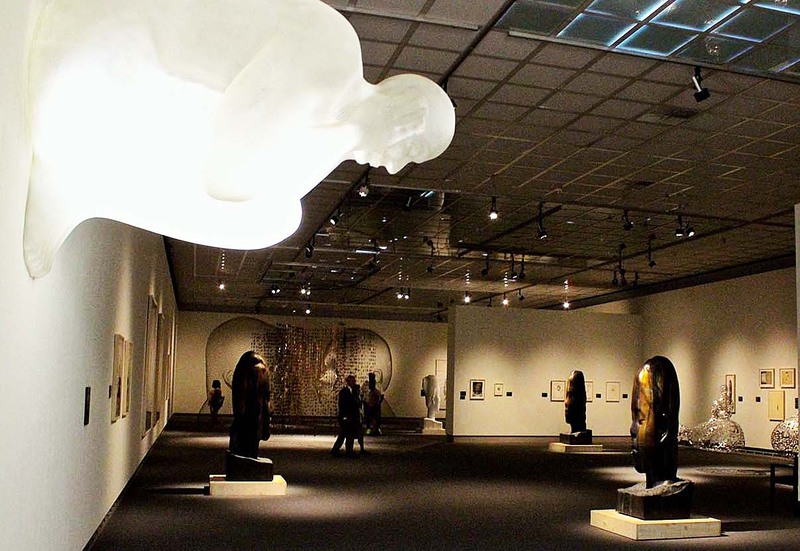 Human Landscape , a quasi-retrospective of Plensa’s recent work has just opened at the Toledo Museum of Art, and features a selection of his arresting sculptures, six exterior works sited on the grounds surrounding the museum, and an array of his lesser-known works on paper. The cumulative effect is an exercise in gazing, quite literally, into the face of humanity. Plensa’s use of scale is nearly enough on its own to inspire awe, casting and carving sculptural neck-up portraits that stand at or above human size. 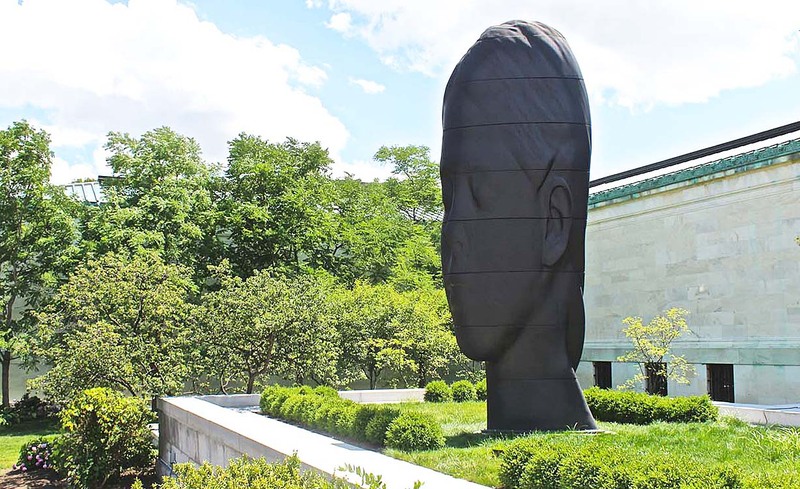 Driving by the museum’s front entrance, one’s gaze is drawn by Paula (2013), a portrait of a young girl from the neck up, rendered in blackened bronze and standing out like an Easter Island head amidst the lush surrounding greenery. Around the museum’s eastern wing another piece, The Heart of Trees (2007) is sited, with 1:1 scale bronze-cast figures sitting in silent meditation at the base of seven live Kentucky Coffee trees, planted into a grove against the hillside and perfectly complimented by the angled verdigris exterior of the Center for Visual Arts. 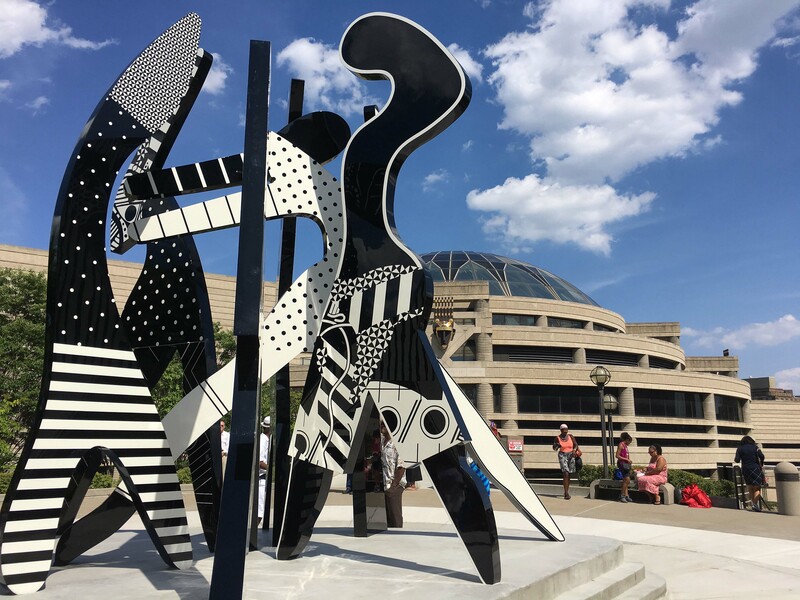 Those driving along Monroe Street by night might find their attention drawn by pieces on the grounds surrounding the Glass Pavilion, two torso pieces – Thoughts (2013) and Silent Music (II) (2013) – and two seated figures, Soul of Words, which are illuminated at night, to emphasize the open weave of their intricate metal work. A figure seated with knees drawn up is a recurring motif for Plensa – at human scale, with The Heart of Trees; at maxi-scale, with Soul of Words; cast in hollow polyester resin, illuminated and mounted on the wall, in an interior trio of works, See No Evil, Hear No Evil, Speak No Evil (2010). This posture, and the tendency for his massive portrait faces to have their eyes closed, suggests that his figures have an interior landscape, as well as the physical one created or augmented by their presence. There is a kind of vulnerability to Paula, even as she towers far above human height, in her closed eyes and solemn expression. Though Plensa clearly delights in siting his works in open public spaces, the gallery works create all kinds of tableaus, as well. 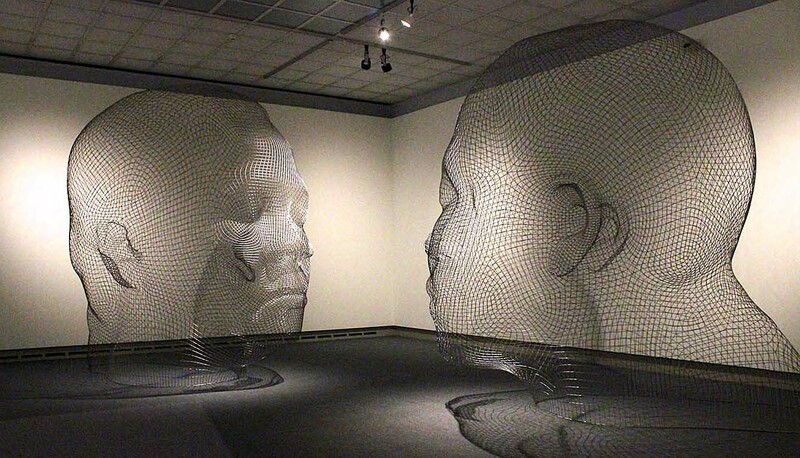 From either of two entry points to the exhibition, the viewer is greeted by a marble portrait head of what appears to be the same woman, Rui Rui (Plensa seems prone to reiterate subjects). Like Paula, Plensa’s head portraits feature an oddly squashed perspective that causes their appearance to shift as one walks around them. What appears to be in correct proportion from one angle becomes slightly or markedly off-kilter from another. The right-hand Rui Rui stands before two massive wire-frame heads in a peaceful sort of face-off in the corner. 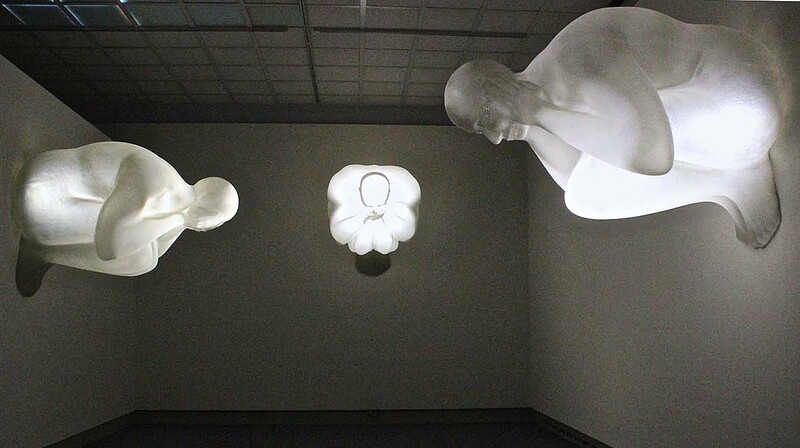 Images on paper line the walls – it is almost jarring to see subjects with fully articulated features and open eyes after all the smooth lines of Plensa’s abstractions. A curtain of iron letters, Silent Rain (2003), divides this smaller gallery from the main gallery with an ephemeral cascade of language – another of Plensa’s recurring themes. 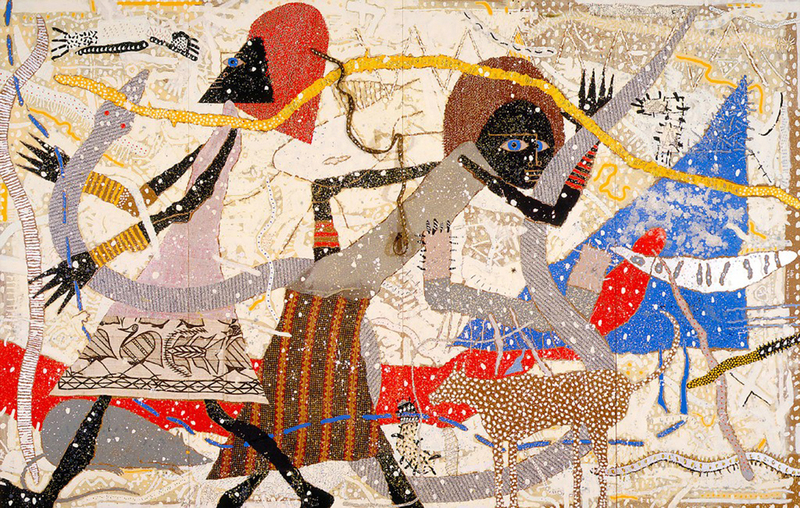 This focus on multi-lingual creations – some of which contain characters from eight different languages – suggests a keen desire on the part of the artist to find ways of bridging gaps in communication, or at least highlighting language barriers as a critical boundary between human societies. 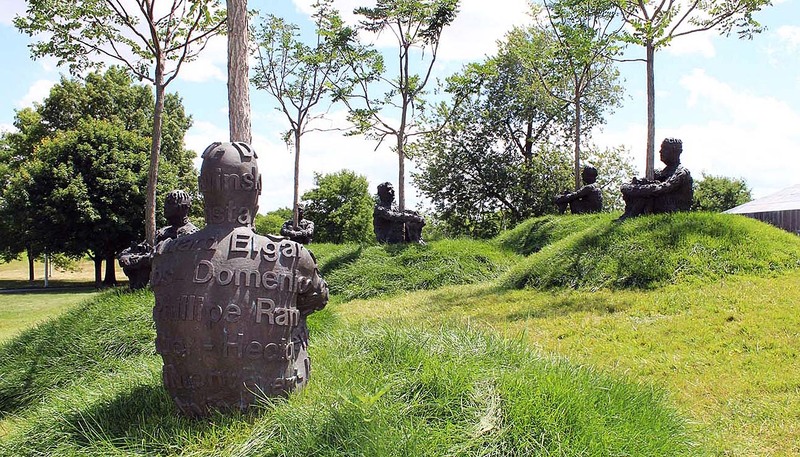 Through works like Silent Music, Thoughts, and The Heart of Trees, Plensa seems to suggest that music might provide a form of more universal connection; other works, like the Evil trio, highlight isolating factors such as anxiety, insomnia, and amnesia. As any portrait photographer can tell you, people love to look at other people. 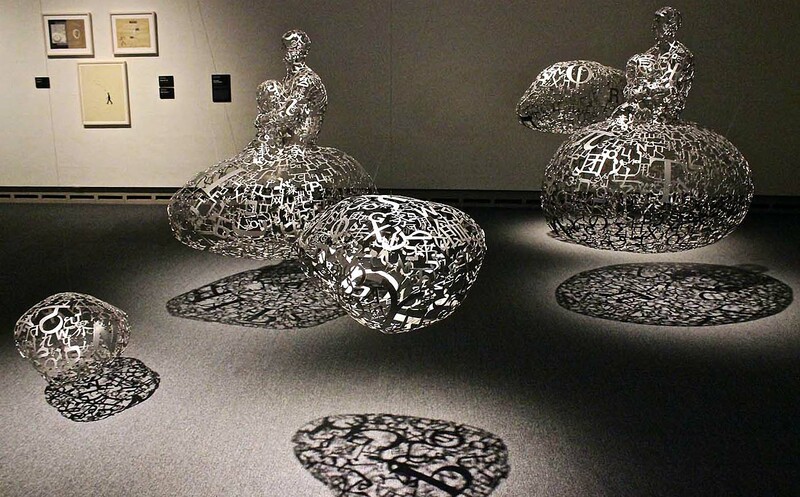 There is a kind of perpetual enchantment with ourselves as subjects, and Plensa’s works play easily into this appeal, while subtly introducing themes of diversity, awareness, and connection – all buoyed by whimsical and unexpected touches. Floating in the main gallery, Talking Continents (III) (2014) features an archipelago of cloud-like forms, a couple of which are ridden by his ubiquitous seated figures. The effect is playful and magic-carpet-like; the seeming effortless lift of the metal forms belies their material structure, and their open motif of linguistic characters throws lacy shadows beneath them. All of Plensa’s environments, expertly installed around Toledo Museum of Art, provide opportunities to pause and wonder at the human condition – arguably one of life’s greatest mysteries, and the one given to all of us, as humans, to contemplate. 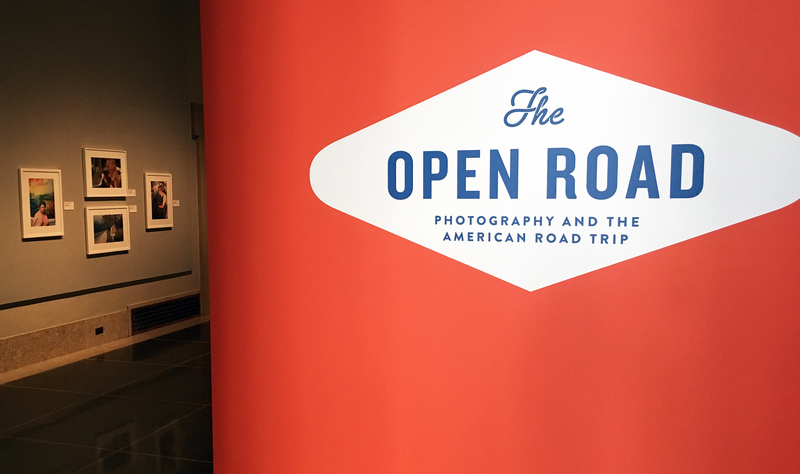 The Detroit Institute of Arts (DIA) opened a photography exhibition on June 17, 2016; The Open Road: Photography and the American Road Trip, sponsored by Aperture Foundation, New York, with a grant from the National Endowment for the Arts. Truer words were never spoken. In my sophomore year of college while studying art and playing trumpet, I read On The Road by Jack Kerouac. I knew that after reading the novel, I had to take a road trip. That next summer I took my VW Beetle across the country to California and ended up in San Francisco’s North Beach listening to Grace Slick and The Jefferson Airplane at the Fillmore. Just by chance, I bought a copy of The Americans, the now famous book by Robert Frank, at the City Lights Book Store. Back then, the City of San Francisco offered free darkroom facilities to its city folk. I had brought my used 35 mm Nikkormat, with a 50mm lens and a carton of Tri-X film, so all I needed to do was buy a box of Agfa paper and start printing images from the trip. What a deal! Much of my experience that summer resonated as I browsed The Open Road. Gary Winogrand (1928-1984) was born in the Bronx, New York, and studied painting at City College of New York. Soon after, he studied photography with Alex Brodovich at the New School for Social Research and was commissioned by Harper’s Bazaar where he linked up with the American Society of Magazine Photographers. This photo, shot in Dallas, Texas, was part of a road trip that took him to fourteen states, where he shot 520 rolls of film. My favorite image is his untitled photo taken at a New York Thanksgiving Parade that captures a male figure high in the air in the middle of a flip off of a trampoline that was on top of a rolling float. 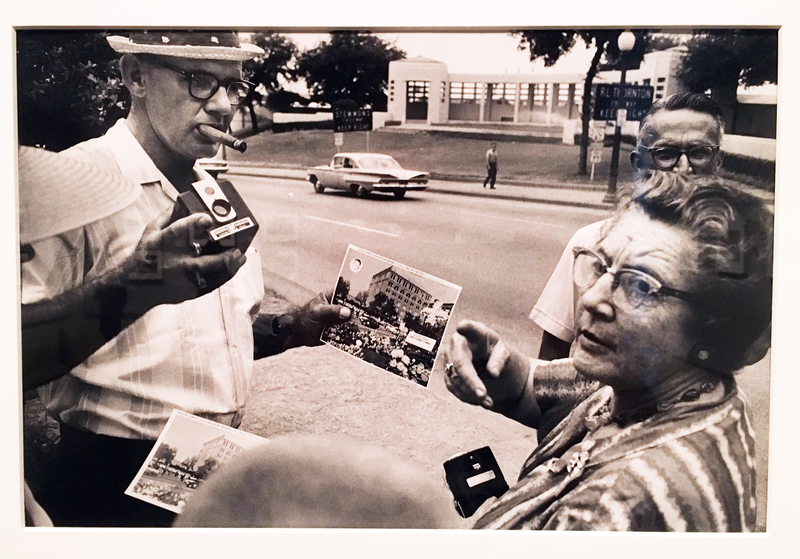 Winogrand taught at Parsons School of Design and the School of Visual Arts, both in New York City. His work is a rendering of a classic street photographer, out of the tradition of Robert Doisneau, Ruth Orkin, and others. This photographer, Shinya Fujiwara, a native of Japan, traveled across the United States for seven months in a motor home, seeking images that were peculiar to his sensibility. A leading Japanese photographer born in the 1940s, he has spent most of his adult life exploring different continents. He brought his life in another country and cultural to his experience on the road. Fujiwara has gone on to influence travelogues and books, both non-fiction, and fiction. 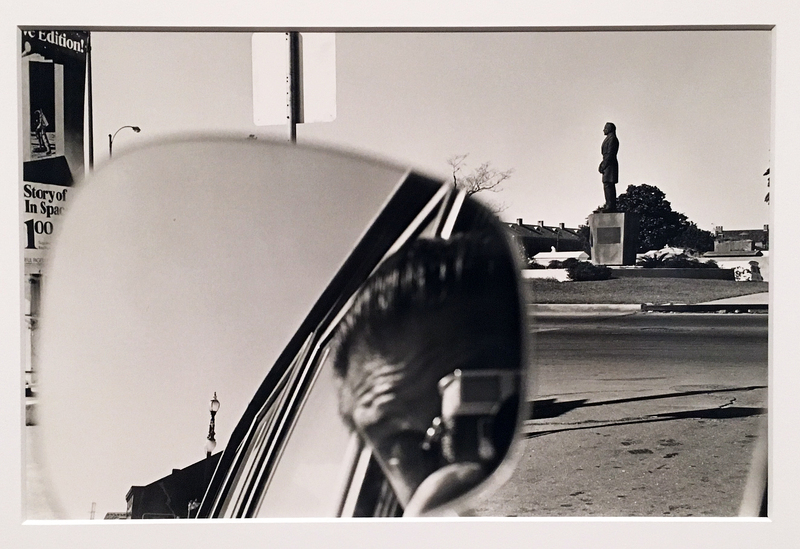 Lee Friedlander, born in 1934, began photographing the American social landscape in 1948. 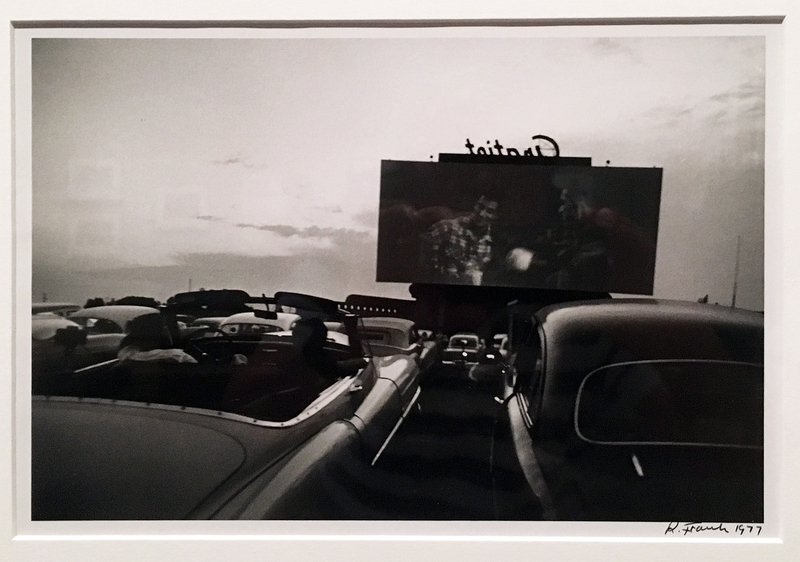 This photograph, New Orleans 1969, reminds me of his 2008 exhibition, America by Car, at the Fraenkel Gallery. It does so, because he used the rear view mirror on his car on many occasions, as a framing device, providing the viewer with a front and rear view of his subject. Friedlander was the recipient of the prestigious Hasselblad Award as well as the subject of a major traveling retrospective and catalog organized by the Museum of Modern Art. In 2010, the Whitney Museum of American Art, New York, exhibited the entirety of his body of work, America by Car. The America photographer, Joel Sternfeld, was born in 1944, received his BA from Dartmouth College and taught photography at Sarah Lawrence College. Known for his large format color photography, Sternfeld was influenced by color theory by Josef Albers. 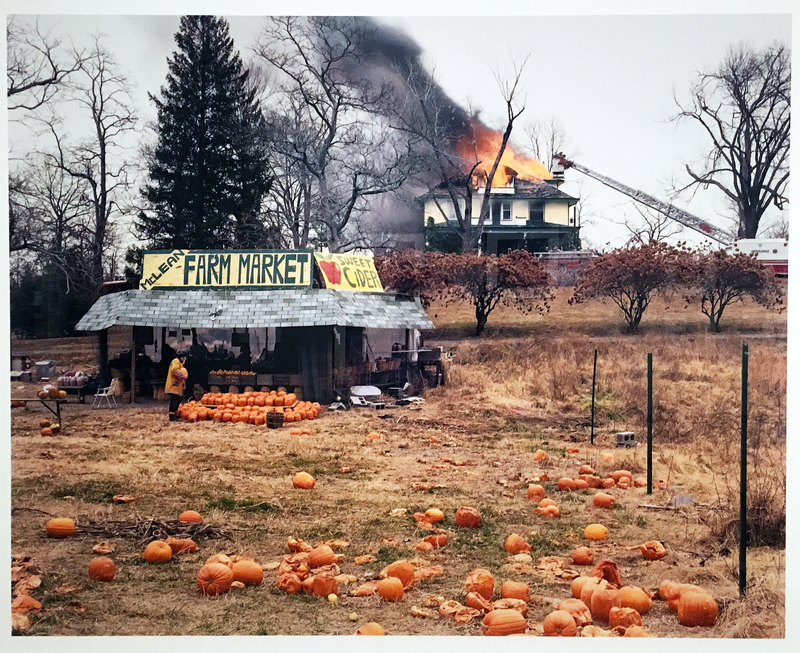 Here in Mclean, Virginia, December 1978, one of his most famous images, he depicts a fireman shopping for a pumpkin as a house burns in the background. The pumpkins’ vibrant oranges match the autumnal colors of the countryside, and ironically, the fire’s flames. The image is peculiar because the fireman appears to be casually browsing as the flames roar. The billboard along a highway with its copy blocked out might just be the surface in transition, waiting for its next advertisement. For Steven Shore, it’s a landscape set against a landscape where he finds art along the road. Stephen Shore’s photographs are attentive to ordinary scenes of daily experience, yet through color and composition Shore transforms the mundane into subjects of thoughtful meditative. He was the first living photographer to have a one-man show at the Metropolitan Museum of Art in New York since Alfred Stieglitz, forty years earlier. 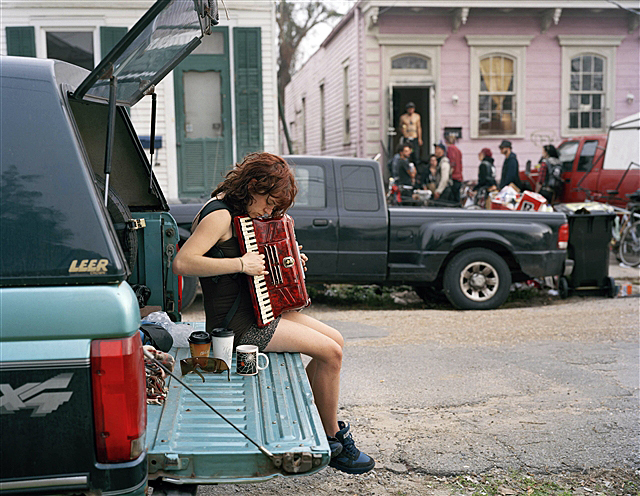 One of the younger photographers in this Open Road exhibition, Justine Kurland, was born in Warsaw, New York in 1969 and studied photography at Yale University, graduating with her MFA in 1998. She was the only photographer who attended the opening at the Detroit Institute of Arts, where she appeared on a panel after the opening. There she described her years on the road, photographing images in all part of the United States, often with her husband and young child. Her photography is comprised of large-scale C-prints, mostly of rural landscapes made up of utopias or pre-industrial worlds. Many of her images capture cars, or parts of them, with anonymous auto-mechanics. She described in her talk the trials and tribulations of raising a family while traveling with the sole purpose of capturing this kind of post-apocalyptic imagery. She gained popularity with her work in the group show, Another Girl, Another Planet, at the Lawrence Rubin-Greenberg Van Doren, in Manhattan 1999, which was reviewed in the New York Times by Ken Johnson. 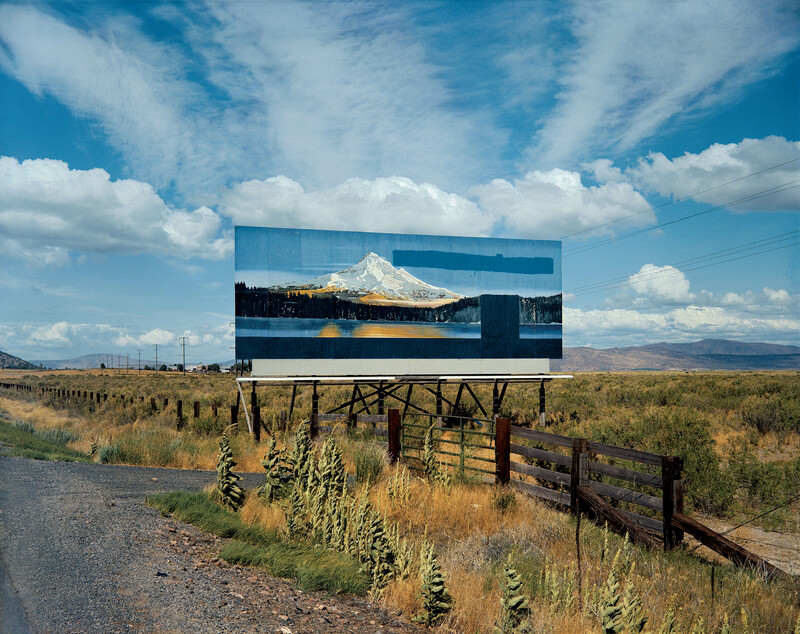 On The Road: Photography and the American Road Trip is a great survey of American photographers who traveled the country in search of moments in time, capturing oddities in the American culture with an eye on composition, color and light. It is good to know and remember that a revolution has taken place in photography, largely due to the technology that has given every smart-phone user a camera. The impact that the digital revolution has had on producing images is immeasurable. Many professional photographers have lost their employment to mammoth stock photo collections, like Getty Images, and with the development of the Internet, the delivery of imagery has made certain aspects of the profession, obsolete. People will say, “Today, everyone is a photographer.” An art director sends the intern out to get a shot with their cell phone. But the truth is that once this settles down, photography by professionals will rise again, and although everyone will still be able to take a snapshot, true artistic composition will be an important commodity. Large format cameras and a variety of lenses with specific focal lengths will become unique and powerful. 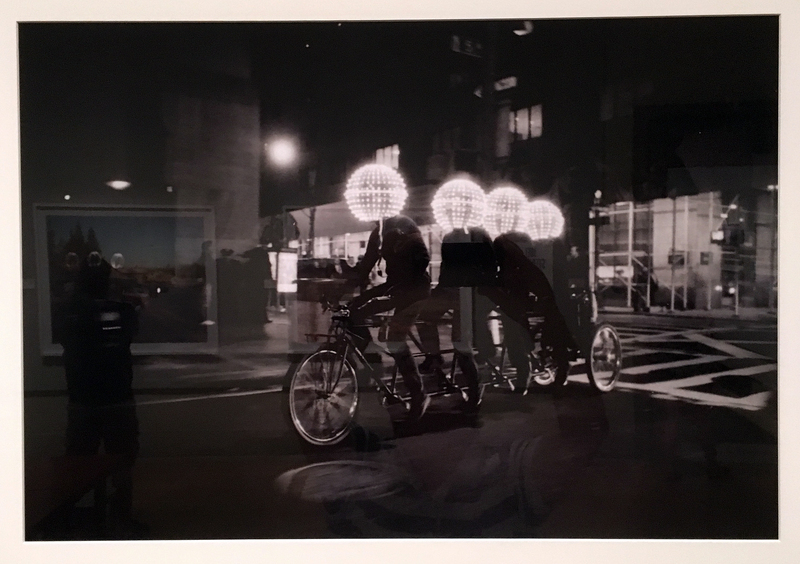 Let’s not forget that photography is an art, and this exhibition, On the Road, serves as an example of how artists use their cameras to capture and create amazing images. 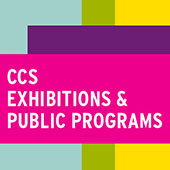 10 a.m. – 5 p.m. Saturday and Sunday. 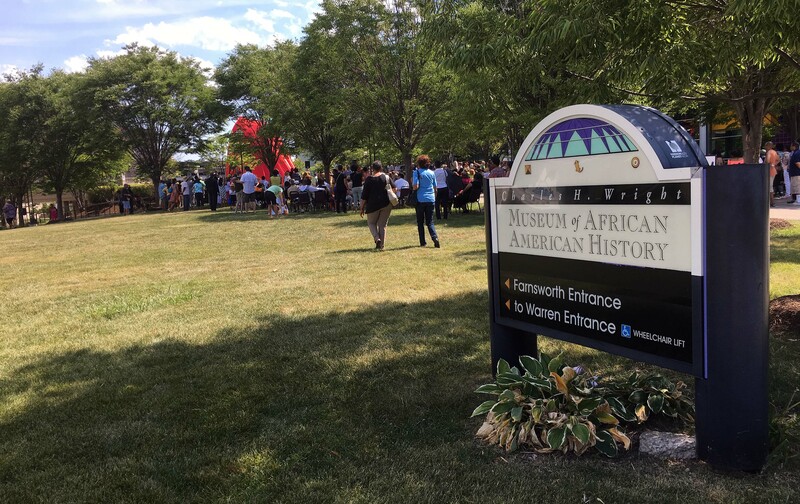 General admission (excludes ticketed exhibitions) is free for Wayne, Oakland and Macomb county residents and DIA members. For all others, $12.50 for adults, $8 for seniors ages 62+, $6 for ages 6–17. For membership information, call 313‐833‐7971.